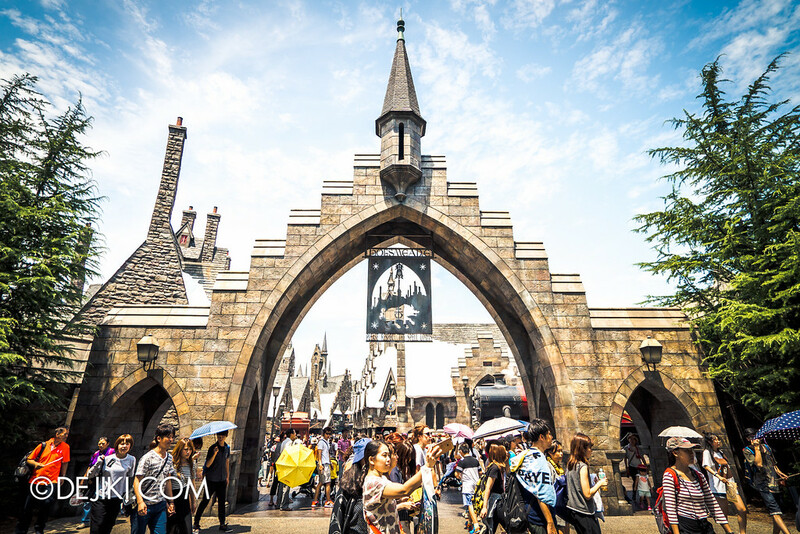 Be spellbound in a realm of magic at Universal Studios Japan’s Wizarding World of Harry Potter. 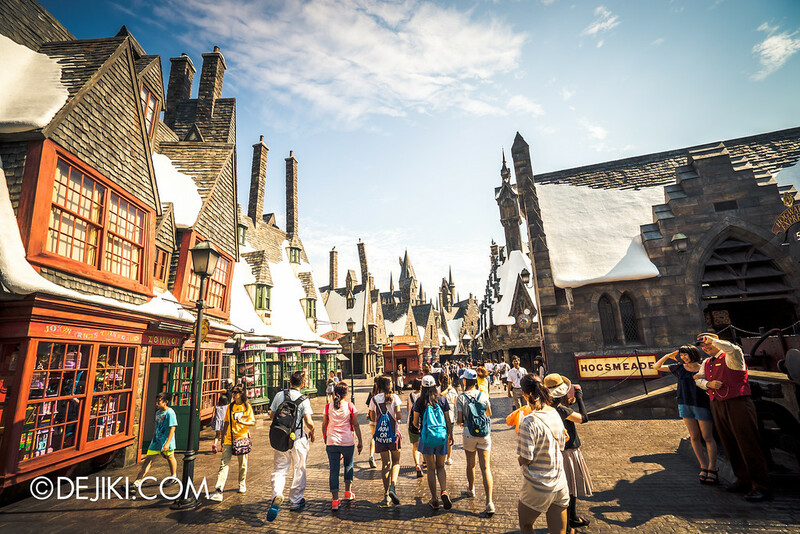 Known as the Harry Potter Theme Park, the Wizarding World of Harry Potter is a major themed zone in Universal Studios Japan. This zone opened in 2014, just four years after Universal Orlando Resort built the original. There are some differences in Japan: there are no Dragon’s Challenge roller coasters, and Hogwarts Express does not operate as a transport. 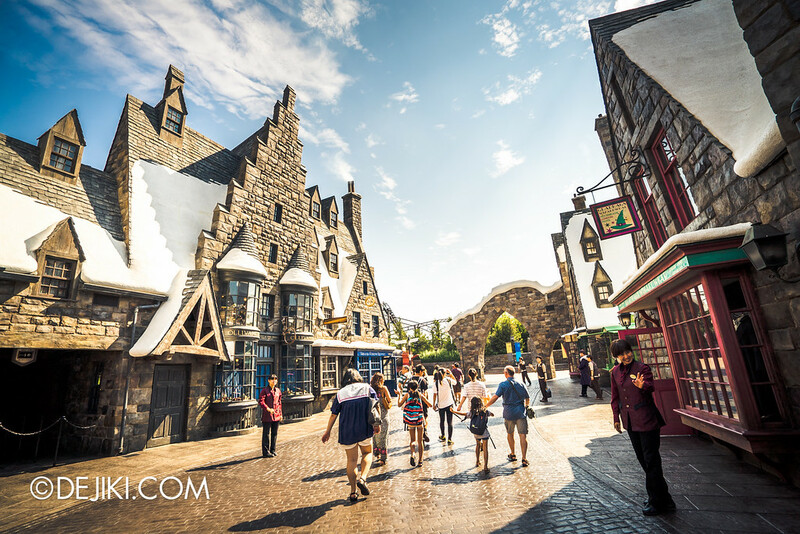 Both Hogsmeade Villages share similar shops, eccentric charm, and two rides – all inspired by the Harry Potter film universe. 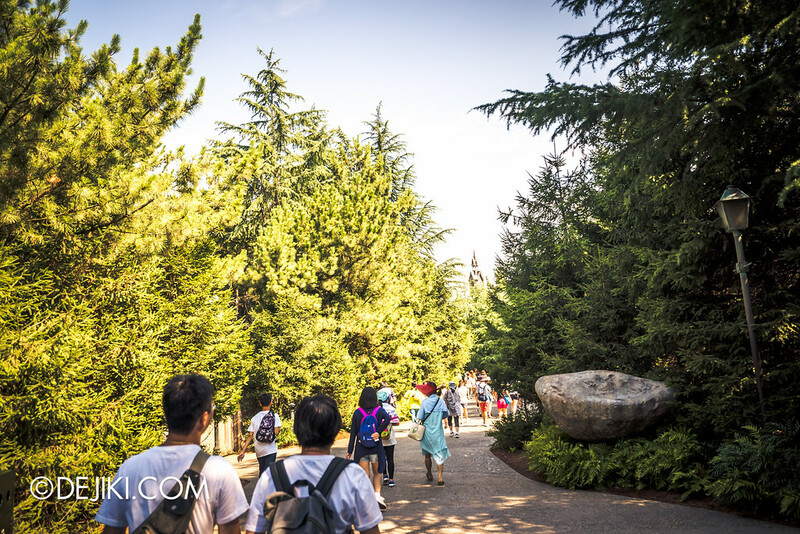 Japan’s version of the Wizarding World tweaked the surrounding environs of the Hogwarts Castle – adding in the Black Lake, and a themed walkway to get to Hogsmeade Village. The audio in the Harry Potter and the Forbidden Journey attraction is dubbed in Japanese. Shows involving live actors, such as Ollivander’s and the Triwizard Spirit Rally, are performed bilingually. 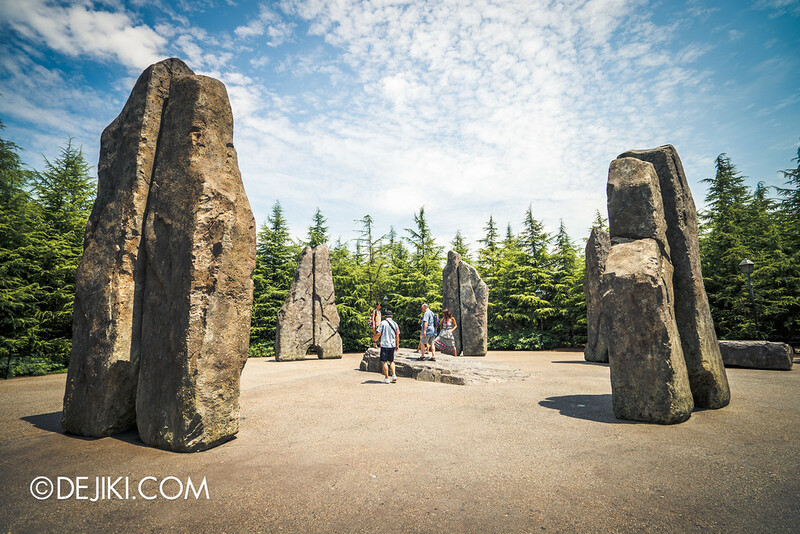 Hogsmeade is far away from the park’s central lagoon, and can only be accessed via this Stone Circle. Doesn’t it look familiar? The path leads into a forest, where familiar motifs from the Harry Potter films stream in. 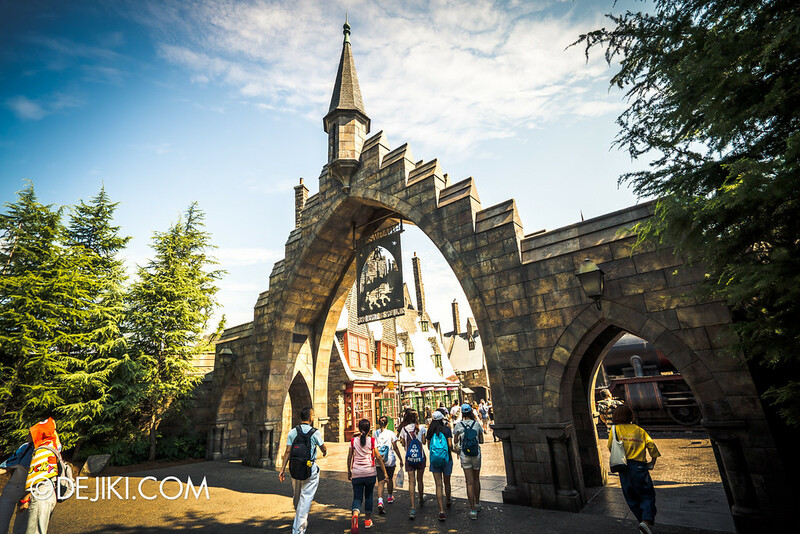 A few minutes in and finally we see – the entrance to Hogsmeade Village. In this area are several shops selling unique Harry Potter-themed merchandise and food. There is also the Three Broomsticks restaurant and Hog’s Head bar. A pushcart vending Butterbeer and the whole area would make any fan of the books and films go giddy – the level of detail is simply astounding. The theming was quite unprecedented for a Universal Studios Park, and Japan built a perfect copy. The Hogwarts Express is one of the highlights here. Complete with steam and sound effects – and a ‘real’ train conductor! 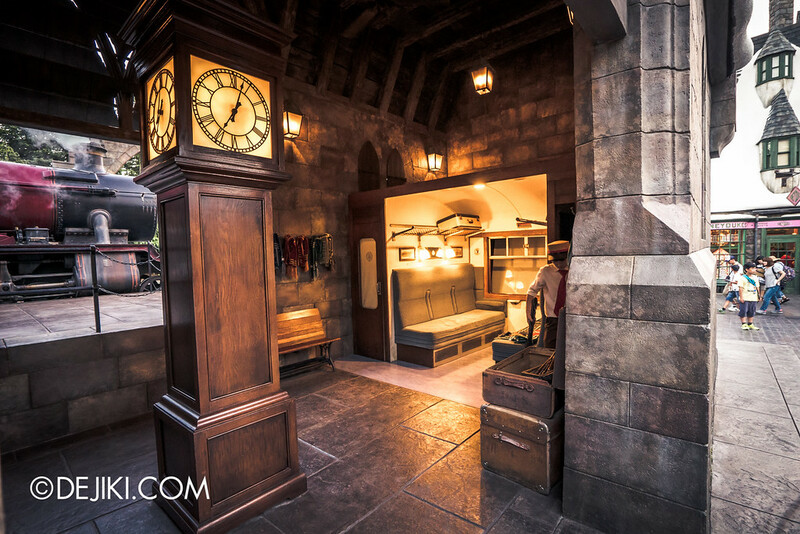 You could even head inside the “station” for a photo opportunity inside a Hogwarts Express cabin. Charges apply. No free photos here. Talking about photos. This Wizarding World is quite a big series, so I’ve decided to split it into 7 parts for your enjoyment. The good news is that all 7 parts are already written so there will be no long delay between them. In the upcoming posts, we’ll be touring the restaurant and shops, before making our way to Hogwarts Grounds. The remaining 6 entries will all be published by end of September 2017. 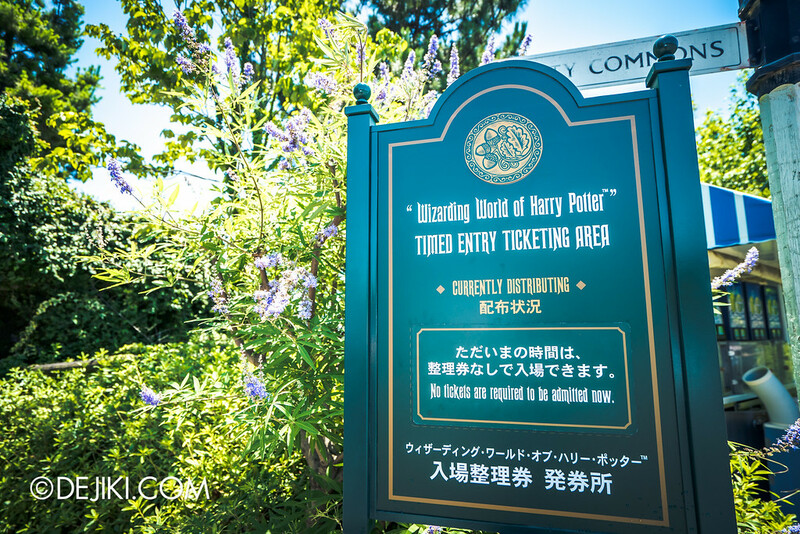 The Wizarding World is a very popular area in Universal Studios Japan and sometimes the park would temporarily limit entry when the area becomes congested. 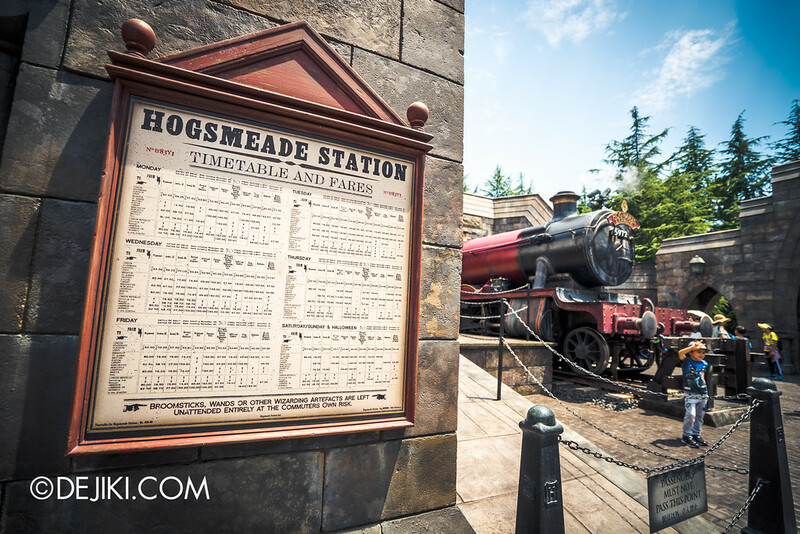 Timed Entry Tickets will be required to enter Hogsmeade Village when the area reaches its capacity limit. 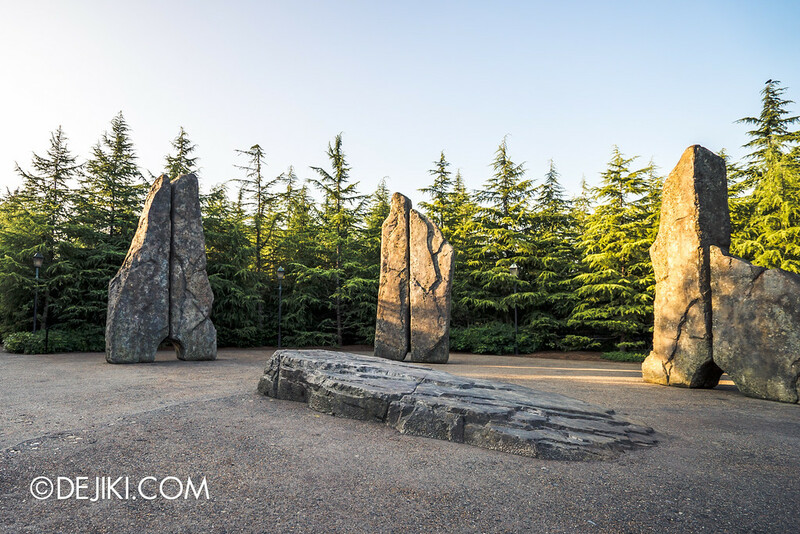 The Stone Circle/ Sundial Garden functions as a holding area when entry is limited – there’s actually a queue area hidden between the trees. Visitors can obtain free Timed Entry tickets at the park on their day of visit. Tickets are distributed at the Central Park area, where timeslots will be available for selection. Alternatively, the Timed Entry Tickets can be obtained in advance as a package for tickets sold by travel partners or promotions. 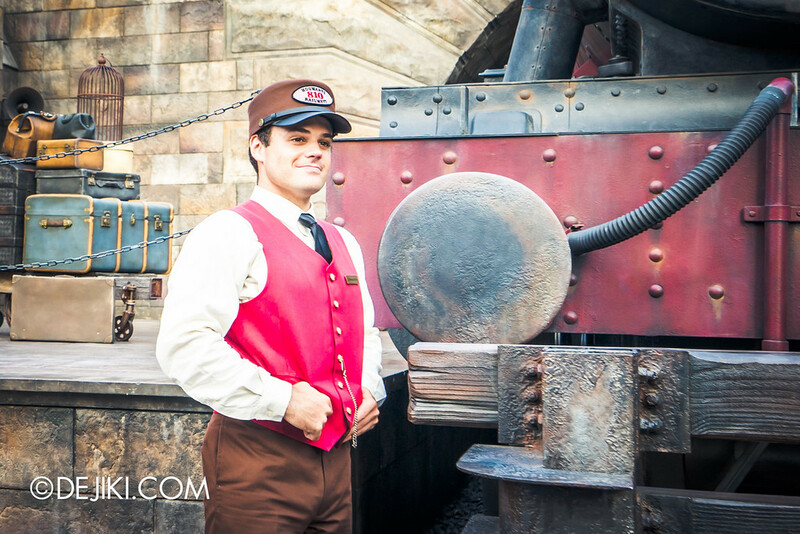 It is also included in certain types of Universal Express Passes. 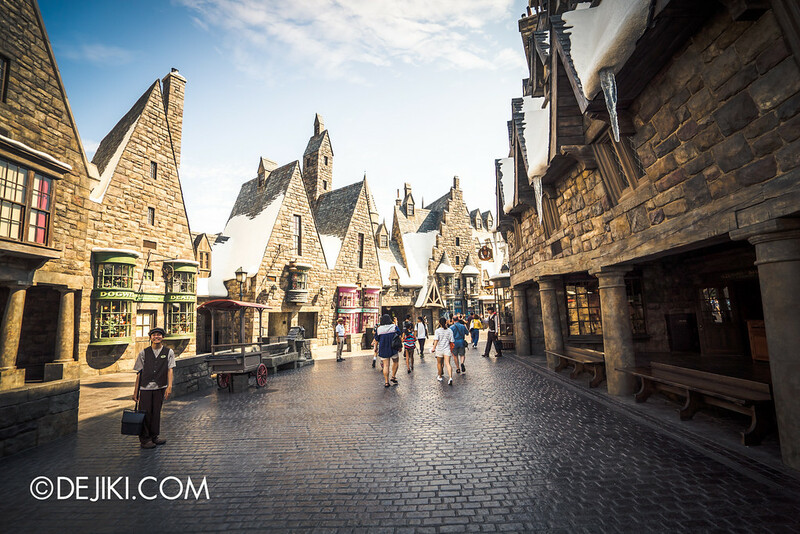 Stay tuned for the next part as we explore Hogsmeade! I went to both of the Wizarding World of Harry Potter in Orlando and LA, and I have to say that the one in LA looks exactly like this. 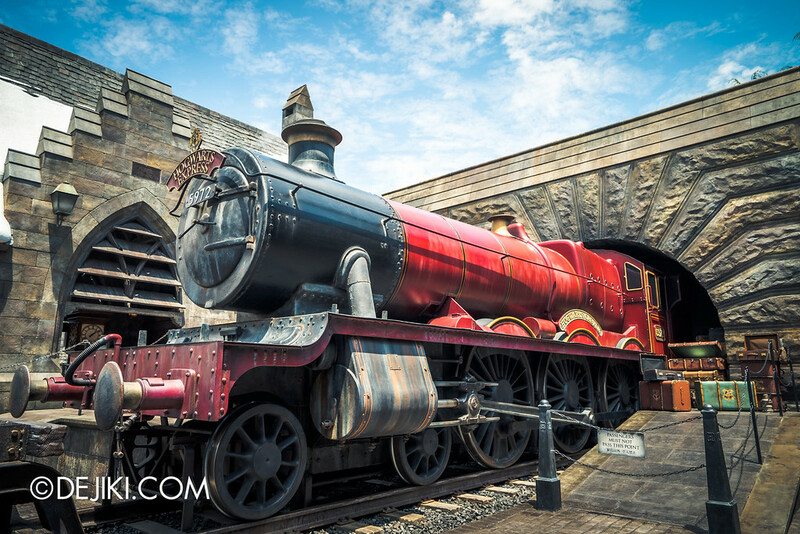 Orlando’s WWHP does not have Hogwarts Express parked next to the front gate of Hogsmeade (well, it’s because they HAVE the train). In my opinion, the placement of Japan’s WWDW is better, because Hogsmeade at Orlando and LA are in between the another park themed areas. Apart from that, I hope that Comcast can buy the majority shares of Universal Studio Singapore so they can build WWDW right there. Anyways, can’t wait for the upcoming post! I’ve been reading you blog since a couple of years ago. Keep up the good work! 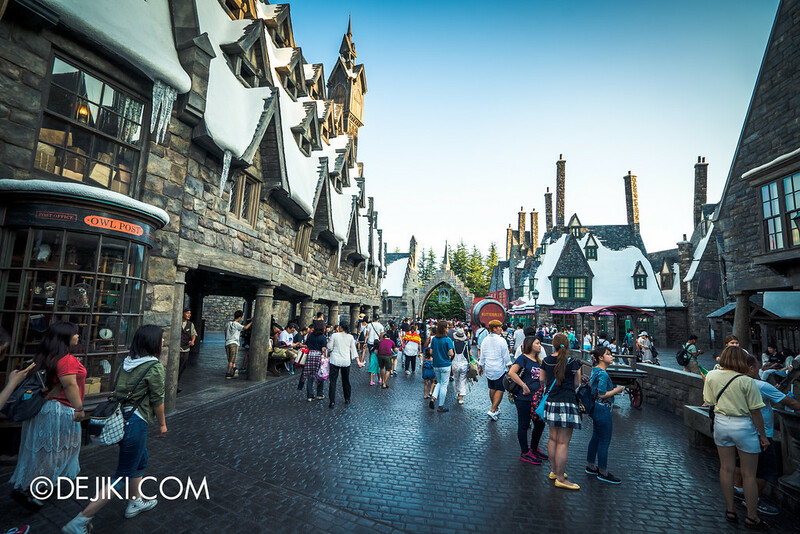 Thank you for your kind words – yes, stay tuned for the rest of the posts covering Wizarding World, and hopefully other theme parks in the region! Definitely agree with what you’ve shared. LA’s Wizarding World is the third one to be built, so it’s quite similar to Japan (they’ve learned a lot since the first in Orlando). As for the Comcast buyout, it’s something that many local theme park fans are hoping for. Great post and photos as always. Will you be doing posts focusing on the other zones of USJ? Hi Jeremy, Thank you for your kind words – Yes, there will be photo tours of other zones in USJ as well. Given the editorial lineup, they are likely to be out after I’ve finished covering HHN in Singapore – stay tuned! The original Wizarding World in Orlando opened in 2010. That’s actually 4 years before the USJ version. Thanks for pointing that out! My original draft initially referenced 2012 as USJ announced that it would be adding the Wizarding World to Japan as part of the global expansion. hi, i will be visiting Osaka next month, your posts will be helpful. but just checking with you, what time did you arrive at the park, and what time did you enter the harry potter section, where a timed entry ticket is not necessary? thank you.